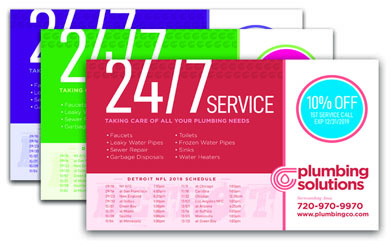 The plumber marketing Postcard Magnet is two promotional items in one: a full color magnet attached to a large postcard, and mailed to a list you provide. Pricing includes free printing setup, free online proof, free mailing prep and free post-office dropoff (postage is additional). And our Plumber design template makes things easier: just fill in the blanks (below) and we'll customize your layout perfectly. Call us about out Zip Code or Carrier Route mailing lists for lowest postage (low as $0.19 each) or send us your mailing list. 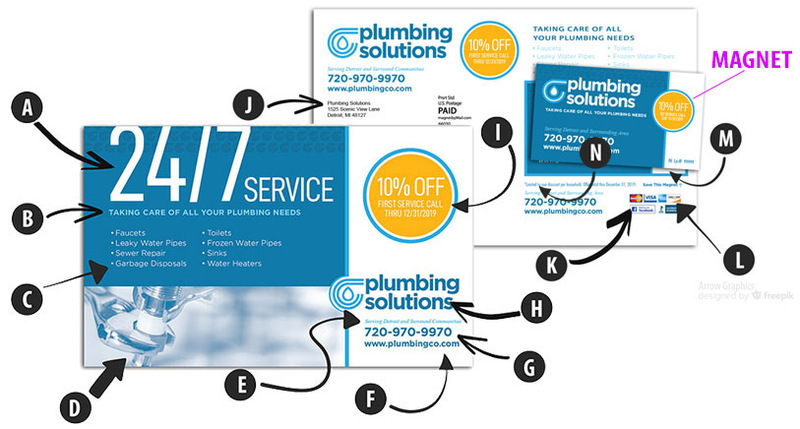 Start your postcard marketing today! We focus on making awesome-looking cards. After all, we know each one could lead to a customer for you. Demi postcard is 5-1/4" x 8-1/2" printed in full color both sides on 10-pt card stock, and magnet is 2"x 3-1/2" printed in full-color. Mailing addresses are inkjet printed onto each postcard. 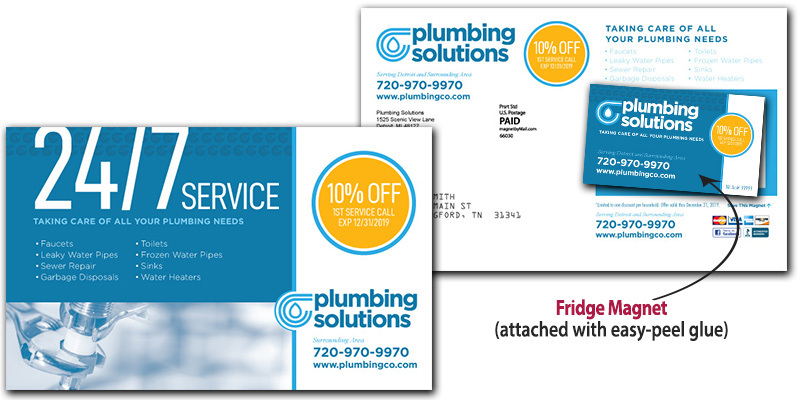 Choose between our economical LITE style with 20-mil magnet and gloss UV-coated postcard on front; or our Premium style with 25-mil magnet and laminated postcard. Pricing is based on style (Premium or LITE) and quantity. Postage is additional. for orders up to 5,000 quantity, please allow 10 working days from proof approval. free mail prep included for one mail list. Includes address validation, inkjet addressing, processing USPS forms and post office dropoff. choose from 3rd (Standard) Class bulk mail ($.30 ea), or First-Class mail ($.43 ea). Our Zip Code and Carrier Route mailings qualify for special 3rd Class saturation rates as low as $0.19 each. Mailing piece is "machinable, automated." we can use your postal permit, or our permit. Optional NCOA list processing is available: $49 per list. Prefer to use your own artwork? -- please contact us for details. Don't have time to fill out the form? Questions? We can customize colors to match your logo. Ask us for more details!